Habit at El Charco del Ingenio (Jardín Botánico y Reserva Natural). San Miguel de Allende, Guanajuato, Mexixo. Origin and Habitat: Yucca filifera is a member of the Asparagaceae family subfamily Agavaceae native to the Chihuahuan desert in North-Eastern Mexico (Coahuila, Guanajuato, Hidalgo, México, Michoacán, Nuevo León, Querétaro, San Luis Potosí, Tamaulipas and Zacatecas) where it is seen by the million along roadsides and sometimes form forests extending over many square kilometers of countryside. Yucca filifera occurs in more Mexican states than any other species of Yucca. Altitude range: 450 -2400 metres above sea level. Habitat and ecology: Yucca filifera is a widespread species occurring on plains and lower bajadas in deeper soils derived from limestone, and from rhyolite and other volcanic rocks in Chihuahuan desertscrub, grassland, thornscrub and occasionally in oak/pinyon/juniper woodland. Yearly rainfall across much of its range averages 300 -625 mm . It can form vast forests on lower bajadas. These forests can extend for many kilometers along the base of a mountain range. Densities of up to 300 plants per hectare are reported in some areas. This species is seldom encountered on steep, rocky slopes; preferring areas with deeper soil. Description: Yucca filifera is a tall, heavily branched yucca up to 10 m tall and developing a massive spreading trunk base with age. The leaves are straight, sword shaped, growing in rosette-shaped bunches from the end of each stem. The inflorescence hangs over and is made of many separate white flowers. The plants take many years to develop into large specimens. Stems: Statuesque, commonly 6-10 m tall (Some exceptional individuals of this species may reach nearly 15 m in height). Some individuals are sparingly branched while others have dozens of branches. Spherical clusters of leaves are carried on the ends of branches. Leaves: Leaves 30-55 cm long by 2-3.5 cm wide, rigid, olive-green with a brown margin bearing recurved or curling fibres, though old leaves often lose the fibers, and a sharp terminal spine. Old leaves remain attached to the branches and trunk, forming a skirt around the stem underneath the crown of living leaves. 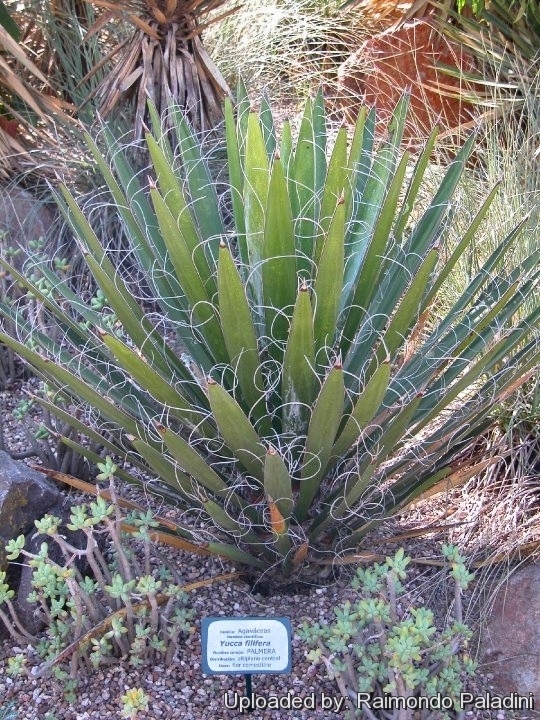 Inflorescences: Terminal, oval up to1.5 m in length, erect in the beginning, but distinctively pendulous after flowering, which distinguishes the plant from Yucca decipiens. Flowers: Creamy-white, tepals segments oval or broadly oblong, acute, shorter than filaments. Fruits: Oblong, 5-7 cm long. The mature fruits are fleshy. Phenology: Y. filifera presented only one reproductive period, which began in february and reached its highest production in march and April, and extending into August. Inflorescences on different branches of the same plant often flower at different times. Similar species: Yucca filifera is similar to the related Yucca decipiens and the two species grow together where their ranges overlap. The inflorescences of Y. filifera are the most apparent. Yucca filifera also resemble the Joshua tree of California (Yucca brevifolia), but differs in having the flower cluster hanging directly downward. Notes: Not to be confused with the invalidly published name Yucca filifera Engelm., a synonym of Yucca baccata. 1) R.J. Hodgkiss, "The Yucca Page", 18/12/2015 , accessed 26 May. 2016. 2) Wikipedia contributors. "Yucca filifera." Wikipedia, The Free Encyclopedia. Wikipedia, The Free Encyclopedia, 20 Jan. 2015. Web. 26 May. 2016. Cultivation and Propagation: Yucca filifera is a carefree and durable plant that provides great colour contrast and foliage interest, but very slow growing. Plant in the garden for a unique feature or grow in decorative containers. It requires little maintenance, with low water requirements. During the summer this yucca can be placed outside in its container. In the fresh air it grows noticeably more quickly. Soil: It grow in any well drained soil, acidic or alkaline, and it is moderately tolerant of salt spray and salty soils. It is adapted to a dry environment, but has a good tolerance to moisture and humidity when planted in a well-draining soil. Waterings: Provide little or no water in winter. Treat like a succulent. However, they grow faster if watered well (don't water the crown, though they rot easily). In the garden they should be placed in a sunny, well-drained area with additional summer water in dry climates. Exposure: Spineless yucca tolerates full sun to shade, but with shade and humidity, it may may become leggy. Hardiness. As a garden specimen it has shown only moderate frost tolerance, usually damaged or killed below -8° C unless kept bone dry - difficult because of its eventual height. Away from milder gardens it is worth growing in the conservatory or greenhouse because of its densely-leafed, almost bottle-brush array of spiky-tipped stiff leaves that are equipped with attractively peeling threads along the margins. Manteinance: Plants outgrowing their space can be chopped - new branches will form along the sides of the trunk. Use: Yucca filifera can be cultivated in xerophytic conditions. It is used as roof covering and as a source of fibre for handcrafting by the indigenous people, who call it Palma China or Izote. This species is sometimes planted to form living fences. Propagation: Offsets. The species is also easy to propagate from stems or truncheons. Within weeks it grew roots as it lay on the lawn so as you might guess they are very easy to root. Simply plant sections of stem in well drained soil and keep moist.